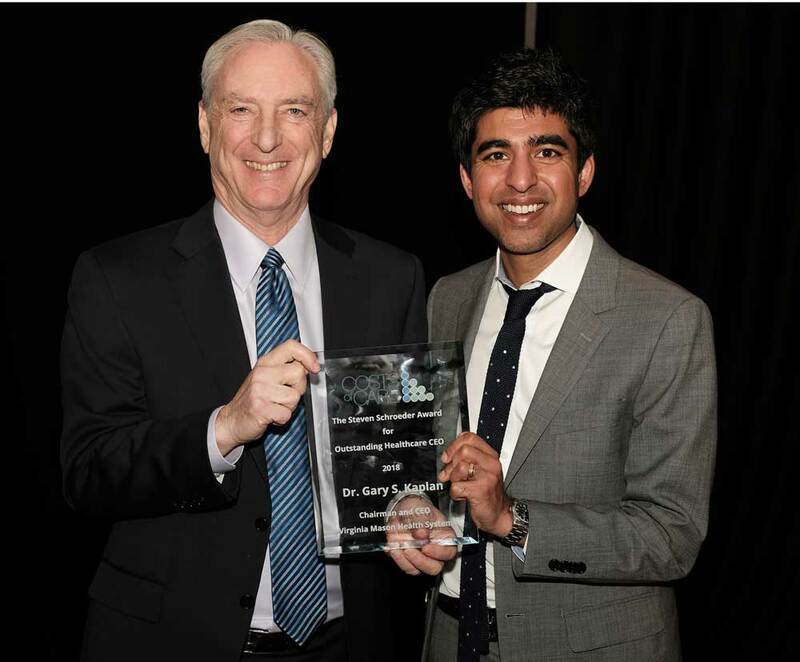 Virginia Mason Chairman and CEO Gary S. Kaplan, MD (left) was presented the Steven Schroeder Award for Outstanding Health Care CEO by Neel Shah, MD, executive director, Costs of Care. SEATTLE — (Dec. 4, 2018) — Virginia Mason and Chairman and CEO Gary S. Kaplan, MD, will both be honored today at The Leapfrog Group's annual Top Hospitals Awards Dinner and Ceremony in Washington, D.C.
Virginia Mason will receive the Leapfrog 2018 Top Hospital Award, designating it as a national leader in quality and safety for the 13th consecutive year. Virginia Mason is the only medical center in the United States to receive the award every year since the recognition program began in 2006. Dr. Kaplan will receive the inaugural Steven Schroeder Award for Outstanding Health Care CEO, which recognizes a health care executive who has demonstrated courageous and ethical leadership in addressing the twin issues of affordability and quality. The award will be presented by Neel Shah, MD, founder and executive director of Costs of Care, a nonprofit organization that strives to help health systems provide better care at lower cost. The award is named for Steven Schroeder, MD, former president and CEO of the Robert Wood Johnson Foundation who is a Distinguished Professor of Health and Health Care at the University of California San Francisco. The award is part of Costs of Care's annual Value Challenge — launched in partnership with the ABIM Foundation — which aims to inspire and share innovations among collaborative teams of clinicians, educators, quality improvement specialists, and health system administrators from around the country. Virginia Mason is recognized as a 2018 Top Hospital in the Teaching Hospital category for acute-care hospitals that have fewer than 500 licensed beds and an established medical residency program. To determine its Top Hospital award winners, Leapfrog considered performance across numerous areas of hospital care, including infection rates, medication safety and inpatient care management. The standards are defined in the Top Hospital Methodology. The selection of Top Hospitals for 2018 was based on surveys from nearly 1,900 hospitals across the nation. View the full list of institutions honored as Top Hospitals. Founded in 2000 by large employers and other purchasers, The Leapfrog Group is a national nonprofit organization driving a movement for improving quality and safety of American health care. The flagship Leapfrog Hospital Survey collects and transparently reports hospital performance, empowering purchasers to find the highest-value care and giving consumers the lifesaving information they need to make informed decisions. The Leapfrog Hospital Safety Grade, Leapfrog's other main initiative, assigns letter grades to hospitals based on their record of patient safety, helping consumers protect themselves and their families from errors, injuries, accidents, and infections. Virginia Mason Health System also includes Virginia Mason Memorial, a 226-bed hospital serving Yakima Valley in central Washington since 1950. Virginia Mason Memorial includes primary care practices and specialty care services, including high-quality cardiac care; cancer care through North Star Lodge; breast health at `Ohana Mammography Center; acute hospice and respite care at Cottage in the Meadow; pain management at Water's Edge; an advanced NICU unit that offers specialty care for at-risk infants; advanced services for children with special health care needs at Children's Village; and The Memorial Foundation.